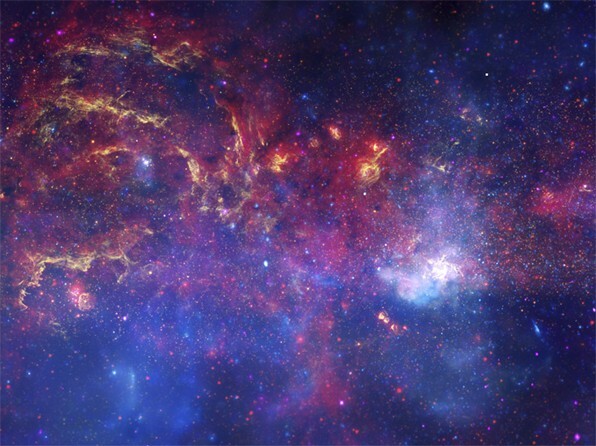 Composite image of the Galactic Center region, combining Hubble images in the near-infrared, Spitzer Space Telescope images in the infrared, and Chandra X-ray images. The bright white region on the bottom right size is Sagittarius A, the Galactic Center. The image spans about 0.3 degr. across the sky, corresponding to about 170 light year at the distance of the Galactic Center. See APOD for details, and for an annotated image. Image credit: NASA, ESA, SSC, CXC, and STScI. The Galactic Center - Sgr A* - is essentially invisible in the optical, and is only a faint infrared source. It does, however, stand out in very high energy gamma rays. One the first SOMs, exactly five years ago in December 2004, reported the detection of VHE gamma rays from the center of our Galaxy, at the time based on data obtained with the first two H.E.S.S. telescopes during 16 h of observations in 2003. Within the - at the time unprecedented - precision of 30" in RA and Dec, the location of the source HESS J1745-290 was consistent with the Galactic Center, and the spectrum of gamma rays was consistent with a power law. It remained unclear, however, if the gamma rays originate from the vicinity of the supermassive black hole at the Galactic Center, or from a nearby object such as the supernova remnant Sgr A East. In the five years since then, very high energy gamma ray astronomy has made enormous progress, both regarding regarding the analysis of individual sources and regarding the number of sources - over 100 sources are listed as published or announced by TeVCat in December 2009, about 2/3 of which were discovered by H.E.S.S. 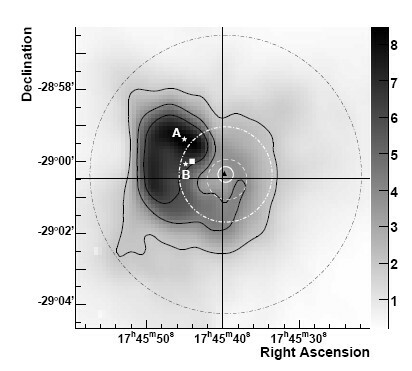 Deeper follow-up observation of the Galactic Center region revealed a second very high energy gamma ray source - G0.9+0.1 (SOM 2/2005) - as well as a ridge of diffuse emission tracing the gas clouds near the Galactic Center (SOM 3/2006, see also Fig.1). 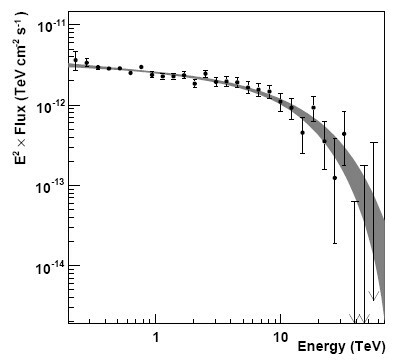 Using 93 h of data accumulated in the years 2004, 2005 and 2006, the energy spectrum of the gamma rays was measured with high precision, revealing a break or cutoff in the spectrum around 15 TeV (Fig. 2). Towards identifying the origin of the gamma rays, a multi-year effort was invested aimed at improving the pointing position of the H.E.S.S. telescopes. Precision pointing of Cherenkov telescopes is non-trivial. Telescope structures are usually less stiff than for optical telescopes, and deformations can induce deviations from nominal pointing of a few 100 arc-seconds. Calibration of pointing suffers from the fact that there are few gamma-ray sources with well-known position, which are strong enough such that statistical errors are small. Cherenkov camera with their relatively course pixels are also poorly suited to use stars for calibration. Using extra star guider telescopes and CCD cameras which - in special calibration measurements - observe images of stars on the closed lid of the photomultiplier camera, systematic errors in the pointing of the H.E.S.S. telescopes could finally be reduced to 6 arc-seconds in each axis, with a comparable statistical error - by far the best source location achieved in gamma rays so far. The thus determined source position is within 8 arc-seconds from Sgr A*, well consistent with the location of the black hole, but is clearly inconsistent with the position of the Sgr A East remnant (Fig. 3). Still, questions about the origin of the gamma rays and the emission mechanism remain. For example, while the Galactic Center emission is known to flare in other wavelengths, no such flares are seen in gamma rays; in fact, the gamma ray flux remained steady during an X-ray flare. It was pointed out that a pulsar wind nebula very near the Galactic Center, within the H.E.S.S. error circle, might be responsible for the gamma rays (Hinton & Aharonian, 2006), explaining the absence of correlated emission. Will it be possible to improve source location even further, down to the arc-second level? Technically, this appears very hard to achieve, but one possible way may be to exploit the "obscuration" of the source by stars orbiting the Galactic Center, as discussed by Abramowski et al. (2009). References: H.E.S.S. publications on the Galactic Center: F. Aharonian et al., "H.E.S.S. observations of the Galactic Center region and their possible dark matter interpretation", Phys. Rev. Lett. 97 (2006) 221102 and astro-ph/0610509; F. Aharonian et al., "Simultaneous HESS and Chandra observations of Sagitarius A* during an X-ray flare", Astron. Astrophys. 492 (2008) L25-L28 and arXiv:0812.3762; F. Aharonian et al., "Spectrum and variability of the Galactic Center VHE gamma-ray source HESS J1745-290", Astron. Astrophys. 503 (2009) 817-825 and arXiv:0906.1247; F. Acero et al., H.E.S.S. Collaboration, "Localising the VHE gamma-ray source at the Galactic Centre", arXiv:0911.1912 and MNRAS, in press. Fig. 1: Gamma-ray emission as a function of Galactic longitude. The rather strong source at the Galactic Center is evident - slightly offset from the historically defined origin of the Galactic coordinate system. 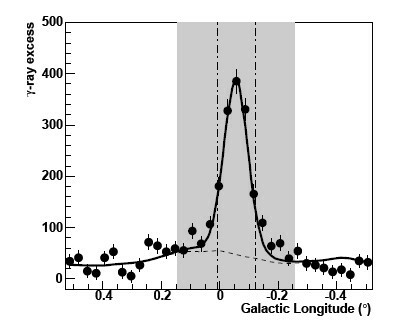 Also clearly visible is the diffuse emission at larger longitude values; for most ranges in longitude an excess of gamma-rays is seen in this background-subtracted plot. Fig. 2: Energy spectrum of gamma rays from HESS J1745-290 as determined from the data sets obtained in the years 2004, 2005 and 2006. The shaded band shows a fit of a power law with an exponential cutoff. Fig. 3: 90 cm VLA radio flux density map of the innermost 20 pc of the GC, showing emission from the supernova remnant Sgr A East. The crossing lines show the position of the Galactic Center Sgr A*. The 68% CL error contour for the position of the gamma ray source HESS J1745-290 is given by the small white circle. The white stars marked A and B denote the position of the radio maximum and the centroid of a radio emission from Sgr A East, respectively.